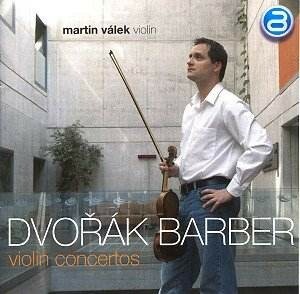 Violin concertos - Antonín Dvořák - Mediální ohlasy - ArcoDiva management - Hudební agentura - Hudební agentura ARCO DIVA Management s.r.o. It’s hard to work out why the Dvořák Violin Concerto has failed to establish itself in the repertoire to quite the extent of other romantic concertos by Brahms, Tchaikovsky or Bruch for example. It is tuneful, splendidly written for an instrument the composer played well (though he probably preferred to play the viola) and entirely typical of its Czech creator. However, there are signs that it is now being recognised for the glorious work it is, and here is another fine recording, this time by a notable young Czech performer. Unusually, Martin Válek – an interesting musician who also indulges, we are told, in jazz and punk – has his father, Vladimir, as conductor on this CD. There is no doubt that there is a thoroughly harmonious partnership here between father and son, and that is of some importance in a piece in which the orchestral part is so full of detail, and into which the solo part is often integrated in an almostconcertantemanner. The finale, with itsfuriantrhythms, is probably the most successful and memorable movement, and seems to bring out the best in the performers. The orchestra find the right ‘village-band’ sound for its episodes, and Válek junior shows great sensitivity, allowing, for example the delicious version of the main theme in the low flutes around 9:30 (track 3) to come through with complete clarity.